When I'm invited to speak anywhere, I DO NOT take it for granted and always consider it a privilege. 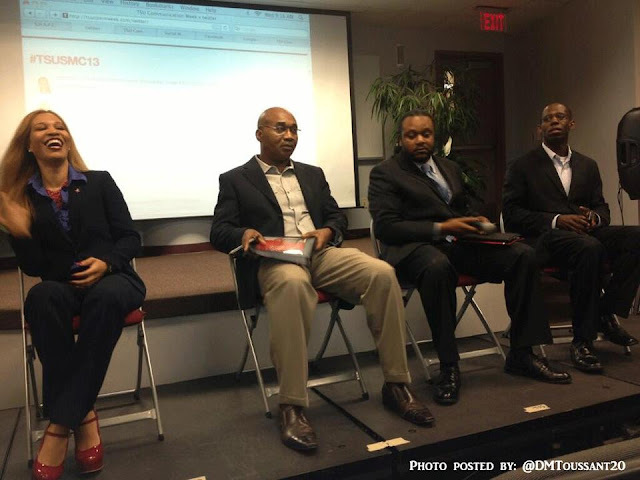 So I must thank Professor Serbino Sandifer-Walker for having me on one of the social media panels, April 17, for Texas Southern University's Communication Week alongside Kenneth Ware, Elizabeth Lloyd, Anthony Ogbo and Desmond Lewis. The theme of the panel was "Social Media is a Game Changer." We had a great time with TSU journalism students. They asked some wonderful questions! I must admit, TSU outdid themselves with this conference and had some serious heavy hitters on the speaker's list. For a Twitter recap of the week-long empowering event, check out the hashtag #TSUSMC13.